Olive tapenade is extremely versatile and can be used as a spread or filling in many different dishes. You can also use it in place of more traditional party dips such as hummus, guacamole, salsa or roasted bell pepper spread. 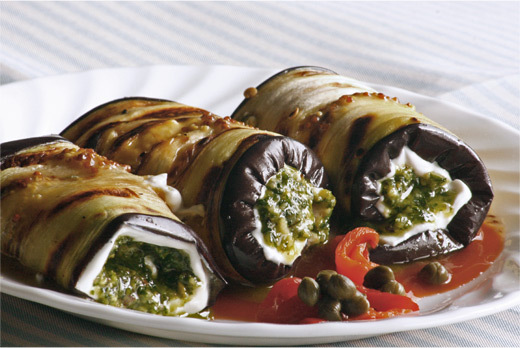 In this recipe, I added goat cheese to the tapenade and used the mixture as a filling for chicken rolls. I served the dish with a mildly sweet carrot purée that makes an excellent foil to the savory flavor of the tapenade. If it's not part of your culinary repertoire yet, you should definitely learn to prepare tapenade. 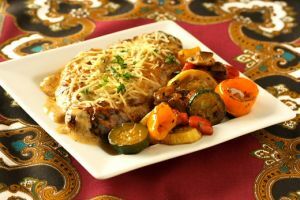 It will open up a whole new world of easy to prepare, delectable dishes. Coarsely chop ½ cup of olives using a chef's knife and reserve the rest. In a mini-food processor (or blender), combine capers, anchovies (if used), lemon zest, 1 teaspoon of sugar, pickled garlic, lemon thyme, 1 tablespoon of lemon juice and 3 tablespoons of goat cheese. Pulse until smooth. Slowly add 2/3 cup of olive oil. Pulse until the oil is well incorporated. Transfer to a bowl. Add the chopped olives (I like the coarse texture of the olives for this recipe; otherwise you can always blend them with the rest of the mixture) and ½ teaspoon of black pepper. Stir well using a spatula. Check seasoning; depending on the saltiness of the anchovies, add more salt if necessary. Season the chicken with salt, cayenne pepper and pepper. Add the fresh minced garlic, papaya paste and baking powder. Toss well. Place the chicken in a large bowl or a sealable zip-top bag. Drizzle with about 1 tablespoon of lemon juice and 2 tablespoons of olive oil. Marinate in the refrigerator for at least 2 hours or overnight. In a large non-stick pan, heat about 1 tablespoon of olive oil. Add the shallots and cook on high heat until slightly golden. Lower the heat to medium-low and cook until soft and tender, about 6 minutes. Transfer the caramelized shallots to a bowl. Set aside. Place one chicken breast on a cutting board. 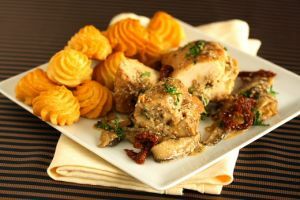 Spread about 1 to 1-½ tablespoons of the goat tapenade filling evenly over the chicken. Carefully roll up the chicken breast tightly. Using 2 pieces of twine, secure the stuffed chicken roll. Repeat with the 5 remaining chicken breasts. Season the outer surface of each roll with more salt and pepper. Using a fine mesh strainer, sprinkle some all flour around the chicken rolls and shake off the excess flour. In the pan, add the rest of the olive oil. Once the oil is hot, pan-sear each side of the rolls for about 1-½ minutes (a total of about 9 minutes) until golden. Finish with a drizzle of red wine vinegar and 1 tablespoon of parsley. Quickly transfer the chicken rolls to a platter. At this point the chicken isn't cooked completely; it will finish cooking in the sauce. Add chicken broth to the hot pan, bring to a boil and scrape the caramelized bits from the bottom of the pan using a wooden spoon (called deglazing). Reduce (uncovered) the liquid to about 2-3 tablespoons. Add the honey mustard and remaining goat cheese. Bring to a boil again and cook for about 2 minutes. Lower the heat to low. Add the crème fraîche, stirring continuously. Adjust seasoning of the sauce with salt and pepper. Add the reserved caramelized shallots, the rest of the olives and chicken rolls. Cover and cook for another 5 minutes. Allow the chicken to rest for at least 15-20 minutes before slicing. Snip and discard the twine threads. Cover the chicken rolls with olive sauce. Serve warm. Garnish with more flat-leaf parsley. I paired it with carrot purée on the side (I'll post the recipe soon). Serve warm. If you don't like the taste of anchovies, just omit this ingredient but adjust the seasoning to taste. Papaya and baking powder are both great meat tenderizers. This was Baji, Lulu's late grandma's secret for tender and moist meat. Peel a green papaya. Grind the cubed papaya with seeds in a mini food processor, place about 2 teaspoons of papaya paste per slot in an ice-cube tray and freeze them. Transfer the ice-cubes 3 by 3 into sealable plastic bags and place back in the freezer. I think it's the best way to keep the same flavor without getting freezer burn. I store them exactly the same as I would extra pesto. Dredging the chicken in flour keeps the moisture in and makes a golden outer crust. Once you add the flour, pan-sear the meat immediately. If you wait too long, the moisture from the chicken will become glue-ey and soggy. I used pickled garlic so that it does not overpower the tapenade. If you don't mind the not-so-mild flavor, use fresh garlic. You can find pickled garlic in any Asian store; they're sold in 16-ounce jars. You can use regular capers but I prefer non-pareil capers for tapenade. They're native to the South of France. This variety has a sharp, piquant and briny aroma. I bought them in a specialty store but you can also find them online. 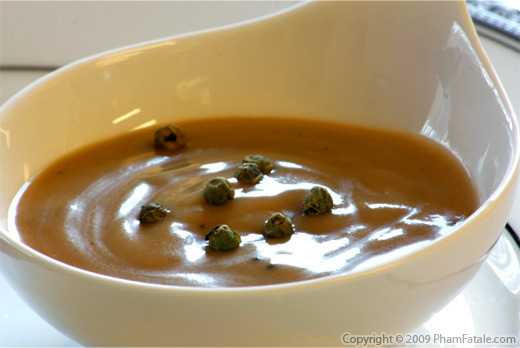 I love using capers; they add a nice salty and sour note in sauces and salads. I used Crottin de chèvre (goat cheese) as a binder so the tapenade doesn't burst out of the sides while cooking. It also adds a creamy texture to the filling. Depending on the season, you can also grill the chicken rolls on a barbecue and finish them in the sauce. You can also use any other flavorings (such as cream cheese, parmesan, blue cheese, basil, dates, dried cranberries). Create your own signature dish. Published By: Jacqueline Pham on January 31, 2010. This dish looks absolutely delicious, I make a much simpler version with goat cheese and basil leaves, but I will try it with tapanade for sure. Thank you. 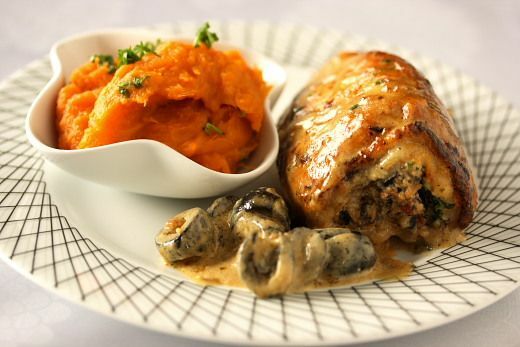 I love tapenade and have lately been on a stuffed chicken thing. Its clear to me what my next dish will be.